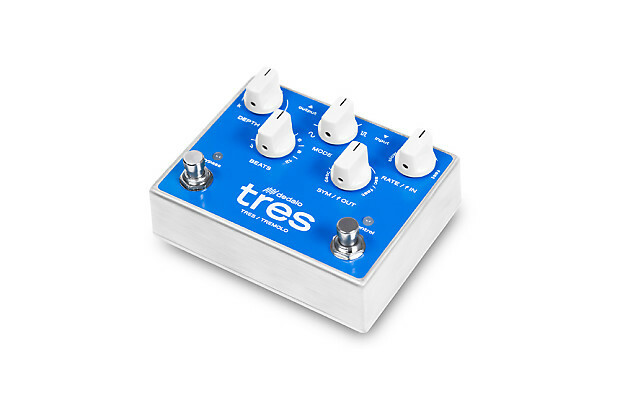 With its FET/LDR analog circuit which provides the most organic and warm tremolo, and its innovative μ-control technology, the Tres lets you create waveforms and sounds that had never been possible. From the classic “vibrato” of old amplifiers, to rhythmic patterns and Fade/Kill effects. NAMM 2016: Editors' Picks "The pedal has a ton of subdivision and wave shape configuration options (the square wave trem sounds exceptionally yummy.) But it also packs less conventional trem tricks, like the ability to blend optical and solid state tremolo and a cool slow ramp function that you can dial in via a tap tempo switch."